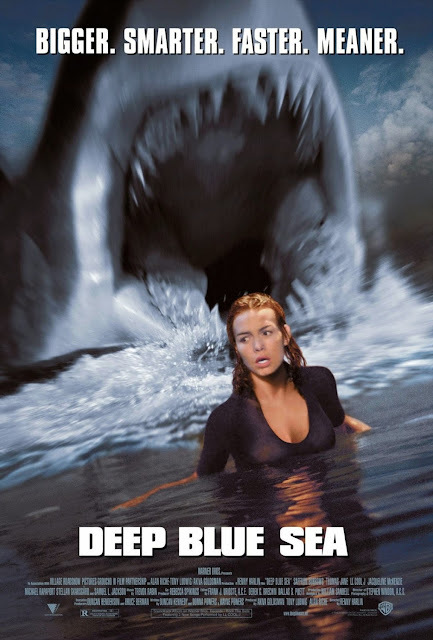 I bought Deep Blue Sea on DVD back in the late 90’s just because it was on DVD. DVD was a new thing, and if a movie looked halfway decent or was cheap, I bought it. To be honest, hearing the plot about intelligent sharks and seeing Renny Harlin’s name directing is enough for me to avoid this film. But the collector in me took a chance on a film that was way better than it had any right being. I’ve revisited the film a few times over the years and most recently in the fall of 2017. The movie is still an absolute blast and holds up well. An ocean based research station comes under attack by test sharks for an Alzheimer’s vaccination. -I love sharks and shark movies like everyone else. Sadly, most of the time, they are cheaply done or utilize horrible CGI. Deep Blue Sea holds up surprisingly well for the most part, and the sharks are believable. -The ensemble cast for this movie is awesome. It’s a combination on paper that shouldn’t work, but just does. This film features: Thomas Jane (The Punisher), LL Cool J, Aida Turturro (The Sopranos), Michael Rappaport (Justified), Stellen Skarsgard (Thor/Good Will Hunting), Samuel L. Jackson (Pretty much everything ever made), and the wonderful Saffron Burrows (Troy). -That scene. I don’t have to say more. If you’ve seen the movie, you know what I’m talking about. If you haven’t, please don’t read anything else on the internet about Deep Blue Sea or it’ll be ruined for you. -All of the scenes featuring LL Cool J and the bird are awesome. It provided some fantastic comic relief and really made you respect LL’s acting career. -The tension in this film is great, especially in the scene where they attempt to biopsy the brain. -The film is full of action with likable characters that you want to see survive. -This is a great movie that I’ve never heard someone say they didn’t enjoy. However, you do have to check your mind at the door when you go into it. This is a fun action packed shark film, nothing more. -The last twenty minutes drags a little, although it all does end nicely. -A sequel is currently filming for the SyFy channel. -Thomas Jane has gone on to do some other memorable horror roles in The Mist and 1922. -The license plate pulled from the shark’s mouth is the same one from Jaws. -Thomas Jane actually swam with one of the sharks, but was only allowed to do so once he finished filming all his other scenes. -The set was at the bottom of a huge tank on Stage 2 at Fox Studios Baja in Mexico, where Titanic was filmed. It was the same stage that held the grand staircase and dining area. It's the biggest indoor tank in the world, 200 by 500 feet and 40 foot deep. After Renny Harlin’s experience with Cutthroat Island, he wanted to film on the most controllable set possible. -The submarine from Sphere can be found in this movie, as well as the sea plane from Six Days, and Seven Nights. Deep Blue Sea is my second favorite shark movie. It’s a little over-the-top but a ton of fun and provides some real scares. I enjoyed revisiting Deep Blue Sea a lot and I have a feeling I’ll be watching this again in the future. Renny Harlin did an excellent job and the cast really put everything into their roles for this film. It’s nice to see that many of them went onto bigger and better things. I rate Deep Blue Sea as an eight out of ten and say it’s a must own. I first saw IT on VHS back in the mid-1990’s. My step-sister had suggested we watch the film one night and after a quick trip to Blockbuster we sat down to watch the beloved Stephen King mini-series. I would never describe IT as a frightening, because it never struck that tone with me, but it’s a film that makes you feel uneasy and tells a fantastic story over three hours. I ended up recording IT onto a VHS tape of my own and I revisited the series quite a few times in my youth. It’s been at least fifteen years since I last saw IT, but I decided one Saturday night in October 2017 to sit down and see how IT holds up, especially in comparison to the new movie. A group of adults are summoned back to their hometown to face down an evil force that they united to face as children. -Tim Curry is brilliant. I know that’s something everyone mentions, but it’s true. He creates this Pennywise character and makes him so menacing you believe that he actually exists. -When I watched the 2017 movie, I loved how they broke up the story of the children and the story of the adults into two movies, instead of bouncing back and forth. After watching the 1990 film, I saw that the flipping back and forth wasn’t as tedious as I remembered and it was well done. -One of my favorite scenes is when the group gets back together for dinner in Derry. It feels like you are witnessing a true life reunion several decades later. -The acting is a little all over the place in the film. John Ritter (Problem Child), Seth Green (Buffy the Vampire Slayer), Jonathan Brandis (Sidekicks), Tim Reid (Sister, Sister), Tim Curry (The Rocky Horror Picture Show), and Emily Perkins (Ginger Snaps) were real standouts. -The library scene with the balloons was fantastic and the tension was perfect. IT is at its best when Pennywise is nearby and the effects are kept simple. -I love the creepy water pumping station and I think it made for a fantastic setting. I hate the new film didn’t retain that element. -Pennywise as Ben’s dad still sends chills down my back the same as it did when I was a kid. There is just something so screwed up and evil that Pennywise would use the likeness of his father to taunt him. -Some other scenes that I really enjoyed was Pennywise talking to Ben once he returns to Derry and showing him the graves awaiting his friends. Also, Beverly’s return to her childhood home. -The scenes featuring blood that the adults seem not to notice are wonderful. It’s creepy and really spoke to me as a child. It was like I had a window into a world that only myself and other kids could see and there is nothing more creepy than that as a child. -I consider myself an Annette O’Toole fan, but not in this film. She has a few moments (the very end), but a lot of this film is nothing but cringe for Annette. -I’m not a fan of the ending at all and I really hope the next IT movie goes a different route. I understand they were working with a TV budget and the novel’s ending is supposedly difficult to film, but hopefully they can come up with something better for the next film. -IT is an enjoyable film that has not aged well. I feel like nostalgia fuels my enjoyment of this movie. -At one point IT was to be directed by George Romero (Dawn of the Dead), but he had to bow out due to scheduling conflicts with the remake of Night of the Living Dead. -In the novel and the 2017 movie, the group of seven survivors are called The Loser’s Club. In the 1990 film they are called The Lucky Seven. -Laura Harris (The Faculty) portrayed one of the girls outside of Beverly’s school that insults her. IT is an essential 90’s horror film, and something that all horror fans need to experience at least once. But I also recognize that in 2017, this twenty-seven year old film has not aged well due to its budget, television origin, and some casting. Thanks to a strong story, IT is still very watchable. 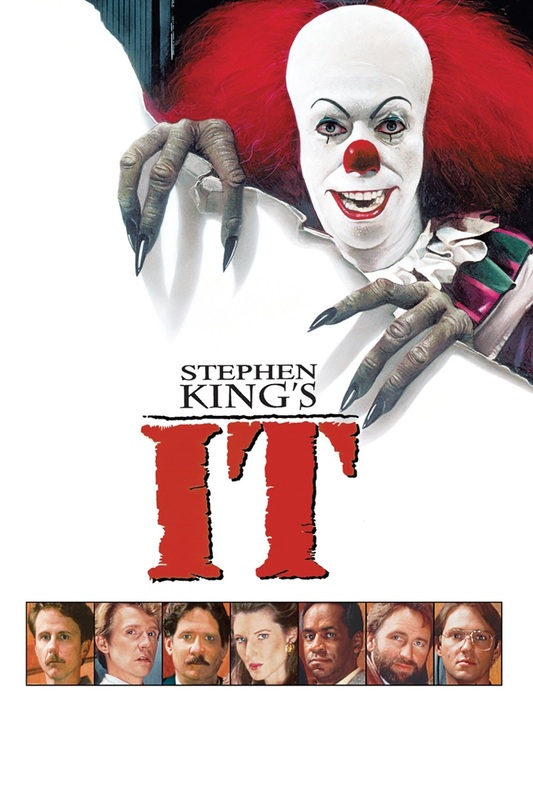 John Ritter and some of the other cast members make the movie feel bigger than it actually is, and I cannot forget to praise Tim Curry who took a character in a book and brought him to life in his own unique way. But IT is long. It was a mini-series, and it clocks in a little over three hours. Of course, it essentially is two movies in one, so the three hour run-time is understandable and acceptable, but it does drag some. I’m not sure if younger fans who just experience IT for the first time in theaters would be able to sit through this mini-series. It was hard to rate IT. Do I rate it how I felt about it in the 90’s or do I rate it how my most recent viewing came across? Do I compare it to the new movie or not? All of these questions entered my mind and I decided to just rate it based off my most recent viewing and forgetting all about the new movie. With that being said, IT is a six out of ten for me and a rental for horror fans. For non-horror fans, I’d just skip this version and move along to the new film. I have a feeling this viewing will probably be my last and I don’t have a need to revisit the film, especially with the superior new movie having come out. I don’t mean to discredit IT’s place in horror history nor its importance, but I think nostalgia makes this movie out to be way better than it actually is. I plan on posting my review of the original IT tomorrow, but until then let’s talk about the 2017 version. I went to the drive-in on the opening weekend of IT. After a year's worth of amazing trailers, I just had to be there opening night. I grew up with IT. The original mini-series aired while I was in elementary school and it was the talk of the school. IT was a terrifying movie about a clown who prayed on children, and what could be more troubling to a young mind than that? In a way I felt like this remake was made just for me. It was a way for me to see the film again and yet still tap into my own nostalgia. The 1980's setting was great, and I really welcomed the change from the original series. 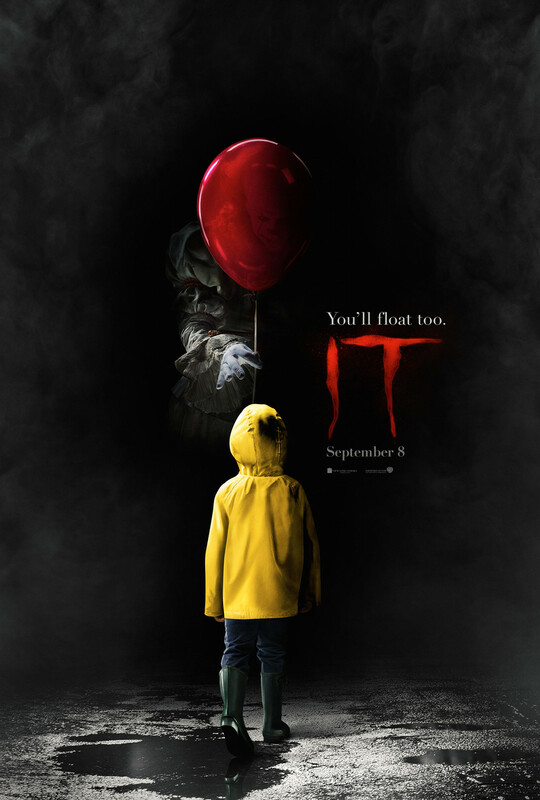 A group of pre-teens encounter a clown who is seemingly the cause for hundreds of cases of missing children throughout the town. -The Loser Club. They were amazing. Every single one of them. The only actor I recognized was Finn Wolfhard, from Stranger Things, who wowed me by portraying a child that is nowhere near the same character he played in Stranger Things. Sophia Lillis was amazing as Beverly and blew the original Beverly out of the water. -Bill Skarsgard brought his own take to IT. It was different and effective. I don’t know if I like it more than Tim Curry’s portrayal, but it worked well within the film. -The town of Derry felt real and lived in. It reminded me so much of an 80’s movie and really reeked of all things Stephen King. -The slide projector scene was fantastic. -There were a few instances of CGI that I could have done without. Still, they kept it to a minimum and it didn’t ruin anything. -The Duffer Brothers originally wanted to direct IT, but they weren’t well known enough. They went onto make Stranger Things which pays homage to Stephen King. -The childhood story was set in the 1980’s instead of the 1950’s like the mini-series and book. -A Tim Curry original IT style clown shows up in the clown room. IT lived up to the hype and was a fantastic rendition of the classic Stephen King novel. I was happy they decided to break the movie into two parts, instead of bouncing back and forth between the adult characters and their child counterparts. This film stands on its own and works as a single film, and that is credited to its great script. The film was no doubt made by its child actors who tore the house down in their performances. It’s going to be difficult to find adult actors who will be able to convey the same emotions and dedications to the roles that these kids had. IT is a very strong nine out of ten for me, and a must own.